Norway’s oldest boat is twice as old as the Gokstad Viking ship. 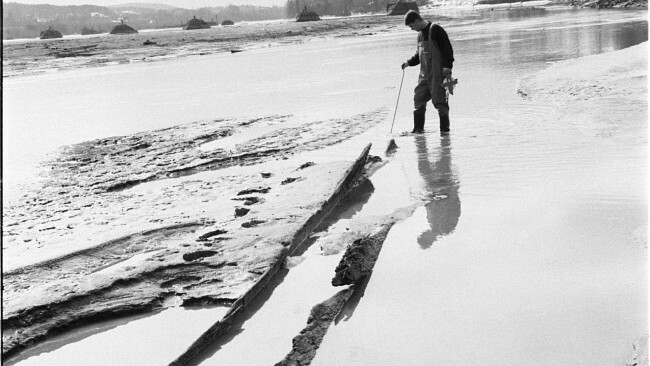 When the river Glomma’s water level was lowered in the middle of the 1990s, a part of a big oak log protruded from the mud. It proved to be an almost intact log boat, with a length of 32feet (9.8 meters). When divers and archaeologists from the NorwegianMaritimeMuseum rescued the wreck, the dating proved to be a sensation. The boat was made in the second or third century before Christ. Thus, the log boat from Glomma is Norway’s oldest preserved boat. This finding provides a unique window into the Iron Age’s human activity in and around Glomma, 200 years before Christ. None had previously studied how this type of boat behaves, how much load it can take, how many that are required to paddle it and the seaworthiness. Log boats are Scandinavia’s first boats, and in Denmark it is found boats that are more than six thousand years old. 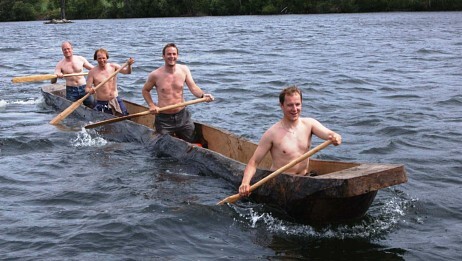 Strangely enough, log boats have been in use on lakes and rivers in Norway in the 1600’s and the 1700’s. Pine wood was used in the “newer” log boats, but the Glomma boat was made from a giant oak tree from the primeval forest that once covered Norway. – Since this discovery is so unique in its kind, we would try to build an exact replica, said Torstein Arisholm project manager at NorwegianMaritimeMuseum. The task was difficult, since there were problems with both funding and above all to find an oak that was big enough. In 2004, the replica was finished – an exact copy of the original. The original log boat is preserved and is displayed at the MaritimeMuseum in Oslo, funded by an anonymous private donor.